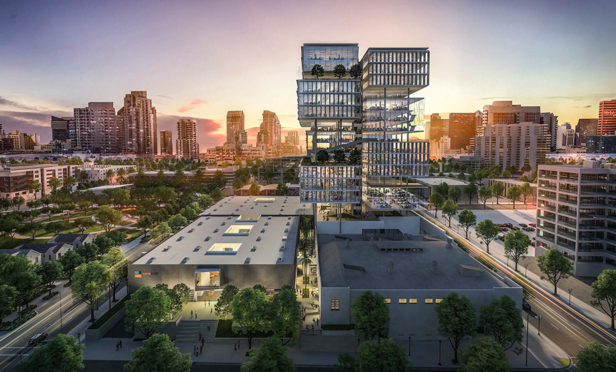 Navarra Properties has plans to redevelop a warehouse in San Diego’s East Village into a 100,000-square-foot creative office warehouse and a 450,000-square-foot contemporary office building. Navarra Properties has announced plans to redevelop a 2.5-acre warehouse site in Downtown San Diego’s East Village. The developer will transform the site into a 100,000-square-foot creative office warehouse and, in phase two, a 450,000-square-foot 17-story conventional office building and will rename the campus SuperBlock@I.D.E.A. District. This is the first creative office warehouse conversion in the East Village market, which has recently seen a spurt of investment activity. Kelsi Borland is a freelance writer and editor living whose work has appeared in such publications as Travel + Leisure, Angeleno and Riviera Orange County. When 2821 ECR came to Palo Alto Housing’s attention, San Mateo Co. was in the midst of re-zonings for the North Fair Oaks area, including meetings upon which the PAH could build, GlobeSt.com learns in this EXCLUSIVE. “We knew introducing a fun and contemporary residential address such as SOMA would satisfy the hunger for a modern building that’s a quick walk from all that makes this Somerset County borough so attractive,” says Nick Hollenbeck of Sterling Properties.